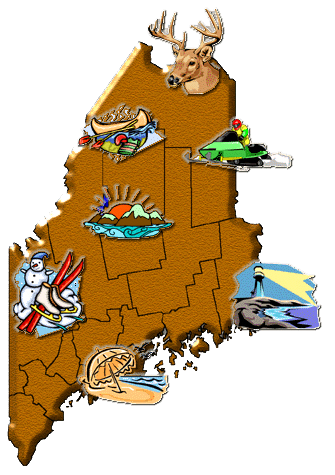 There are a lot of things to know about the State of Maine. There continues to be much interest in the origin of the name of our state, a likely reason being the fact that there is no one, clear answer. The name first appears in writing in 1622 as a province, in a charter of the Council of New England granting land to Sir Ferdinando Gorges and Captain John Mason. The portion which came to be Capt. Mason's alone in 1629, he named New Hampshire. In the same year, a second charter labeled it Laconia. Gorges volleyed with yet another name for his territory: New Somerset. This was strongly disliked by King Charles; he responded in a 1639 charter that it "shall forever hereafter be called and named the Province or County of Mayne and not by any other name or names whatsoever." Despite the tone of finality, this still was not the last word: other suggestions were Yorkshire, Lygonia and Columbus, the latter two appearing as late as 1819, when statehood was imminent. Click a county to view information about that county. Not to be ignored are a couple of interesting facts, which may have contributed to the establishment of our name: 1) there was a small village on the coast of England once named Maine; and, 2) Sir Gorges' family came from a village which neighbored "Broadmayne"; at various times, it was known as: Maine, Meine, and part of it was Parva Maen ("Little Maine"). The prevailing theory has to do with a practical nautical term, "the main" or "Main Land", "Meyne" or "Mainland", which served to distinguish the bulk of the state from the numerous islands. This is still commonly used today. According to G.R. Stewart's Names On the Land, (Houghton-Mifflin, 1958), the name was fixed in 1665, when the King's Commissioners ordered that "Province of Maine" be entered from then on in official records. Twelve years later the Gorges patents were purchased by Massachusetts, but the name remained intact.